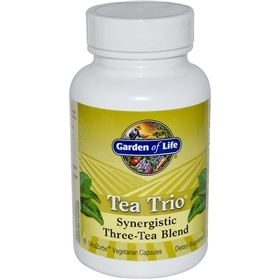 A synergistic combination of three of the world’s most health-beneficial organic teas: rare organic white tea, organic green tea from minimally processed Camellia leaves, and organic black tea derived from a delicate fermentation process. Provides the EGCG of up to 10 cups of tea. Why do you need tea? Tea has been used as a health-promoting beverage for over 5,000 years. Modern research has confirmed tea’s extensive range of health benefits, including supporting antioxidant function, cardiovascular and cellular health, metabolism and energy levels. Tea leaves are phytonutrient-rich, naturally containing many health-positive characteristics, including polyphenols (especially EGCG), L-theanine and caffeine. Why should you use Tea Trio? Adults take 2 capsules per day. May take 1 capsule twice daily.